Last week I had seamless aluminum gutters installed on the garage. When the house was first built I had them installed on the main house but I skipped on the garage to save some money. The reason I decided to put them on the garage was really two fold. The first was to keep the water away from the garage and keep the water from destroying the garden alongside the garage. The second reason was, I plan on installing a couple of rain barrels at some point and the extra water will come in handy. Both times I’ve hired the same gutter contractor to do the work and they always do a nice job. I like seamless gutters for a couple of reasons. First off they don’t leak at joints and they are much “tougher” in my opinion. Secondly when they are installed right they actually look like a piece of molding from the ground level at a distance. As you can see in the close up photo, the gutters are pretty strong after all the supports are screwed into the fascia board. Each of those horizontal supports is screwed into the building and they create a very strong/stiff gutter assembly. I also like the downspout connections. 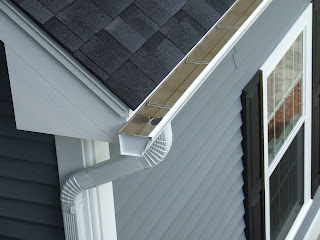 As you can see they the downspout connection has a nice tight “bushing” that is sealed into the bottom of the gutter channel. The end caps are crimped on and sealed as well. So far the gutters are working great and all I need to do now is get some rain barrels so I can start collecting water for the gardens and the lawn this summer when things dry out. If you haven’t uses a gutter guard before, I would definitely use Gutterglove gutter protection. I installed it on my home because it keeps out all the leaves, pine needles and even roof sand grit from entering your gutters because it uses a very fine micro mesh for filtering all debris out. I don’t have to climb a dangerous ladder ever again. Yahoo! 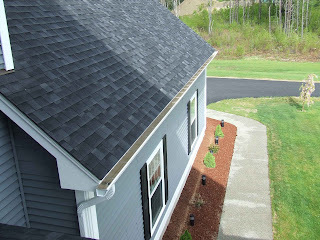 You know, they also go the highest rating in a national consumers magazine from testing numerous gutter guards. I just wanted to recommend them and pass on this tip. Here’s their website: http://www.Gutterglove.com.